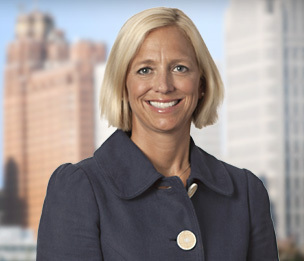 Amy M. Christen assists clients with a full range of employee benefit matters, including compliance and design of qualified retirement plans, health and other welfare plans and fringe benefit plans. As leader of the practice group’s Health and Welfare Team, Amy assists clients develop strategies to comply with the myriad of complex laws impacting employer sponsored group health plans, including the Affordable Care Act, COBRA and HIPAA Privacy and Security laws. Amy also advises clients on employee benefit concerns in mergers and acquisitions and ERISA litigation. Counsels clients on minimizing exposure for excise tax assessments under the ACA Employer Shared Responsibility Rules/IRC 4980H (play or pay mandate). Counsels clients on completion of reporting requirements for Applicable Large Employers under IRC 6055 and 6056 (Forms 1094-B, 1095-B, 1094-C, 1095-C), and responding and defending against IRS’ assessment of the Employer Shared Responsibility Payment (ESRP). Prepares HIPAA Privacy and Security Compliance documents for Covered Entities (employers’ group health plans) and Business Associates (vendors of group health plans), including HIPAA Plan Amendment and Employer Certification, Notices to affected participants and OCR/CMS regarding breaches of unsecured protected health information (PHI), Notice of Privacy Practices, HIPAA Privacy and Security Policies and Procedures, Business Associate Agreement, Authorized Employees’ HIPAA Confidentiality Agreements and HIPAA Authorizations. Conducts HIPAA privacy and security training for workforce members handling PHI for covered entities or business associates. Prepares legal wrap welfare benefit plan document and summary plan description to (i) comply with ERISA and other federal law requirements (including Affordable Care Act (ACA), COBRA, Michelle's Law, HIPAA and CHIPRA Special Enrollment Rights, HIPAA Privacy and Security, QMCSO, Newborn Mother's Act, Mental Health Parity Act, GINA, Women's Health Cancer Rights Act, Medicare Secondary Payer Act, FMLA, USERRA rights, ADA, ADEA etc. ); (ii) specifically describe the employer’s eligibility requirements for participation in each of the plans, the events that will result in a termination of coverage under such plans and any extended coverage periods for employees on leaves of absence and/or retirees; (iii) include clear provisions regarding plan administration, coordination of benefits, subrogation and amendment and termination rights and provisions written in a manner to protect the employer; and (iv) clearly constitute a legal wrap plan document for all welfare plans sponsored by the employer for purposes of filing one consolidated annual return – Form 5500 for all of the various welfare benefit programs. Prepares Code Section 125 cafeteria plan, health and dependent care flexible spending accounts (FSA) and health reimbursement account documents. Prepares retiree health and welfare plan documents and trust agreements (VEBA and Code Section 115 trusts) meeting GASB and FASB standards. Counsels clients on the ability to amend or terminate retiree health benefits for existing and future retirees. Counsels clients on legal considerations for wellness program, including HIPAA/ACA, ADA/EEOC, IRC and ERISA. Counsels clients on coordination of high deductible health plan with health savings account (HSA) with other non-HDHP (including coordination with general and restricted purpose FSA and HRA). Counsels clients on ERISA and state insurance laws impacting multiple employer welfare arrangements (MEWA). Designs and implements tax-qualified retirement plans for private, church and governmental employers, including 401K & profit sharing plans, 403(b) plans, 457 plans, money purchase plans, and pension and cash balance plans. Prepares individually designed plan documents, summary plan descriptions and favorable determination letters, annual reports (form 5500), and required disclosure notices. Negotiates and implements union negotiated changes to qualified plans. Designs and implements early retirement windows. Counsels clients on plan terminations, including preparing plan termination amendments, corporate resolutions and PBGC and IRS forms. Conducts legal audits of employee benefit programs for compliance with applicable laws, including IRC, ERISA, ACA, HIPAA, PHSA, etc. Represents clients in audits and investigations by governmental agencies, include EBSA/DOL, IRS, CMS and HHS. Counsels clients and conducts due diligence regarding employee benefit issues during mergers, acquisitions, spin-offs and other corporate transactions, including preparation of benefit representations, warranties and covenants for the purchase agreements, transition services agreements, employee leasing agreements, retention agreements, severance agreements and corporate resolutions. Counsels clients on benefit plan harmonization and integration following corporate acquisitions, including protected benefits analysis, controlled group transition rules, nondiscrimination and safe-harbor issues and streamlining plan administration. Counsels clients about fiduciary duties and prohibited transaction rules under applicable state law, IRC and ERISA, including plan investments, vendor selection process and plan expenses. Counsels clients regarding controlled group and affiliated service group determinations and impact on benefit plans. Counsels clients and performs non-discrimination testing for retirement and health and welfare plans under IRC. Audits employer classification of common law employees, independent contractors, staffing and temporary agency employees and professional employer organization. Assists Dykema’s litigation team with defending ERISA claims. Prepares IRS private letter ruling requests on a myriad of issues, including VEBA terminations, church plan status, income and employment tax on health contributions, pick-up contributions. Represents clients under voluntary compliance programs of the IRS and DOL, including Employee Plan Compliance Resolution System (EPCRS), Voluntary Fiduciary Compliance Program (VFCP) and Delinquent Filer Voluntary Compliance Program (DFVCP). Assists faith-based organizations with church plan status analysis, plan documentation, private letter rulings and PBGC issues to cease premium payments. Assists Dykema’s Dental Service Organizations (DSO) and Medical Service Organization (MSO) teams with employee benefit concerns, including controlled group and affiliated service group analysis. Retiree Health Care Benefits and Funding Mechanisms, State Bar of Michigan, Public Corporation Law Section's "Winter Conference—Thriving on a Dime"